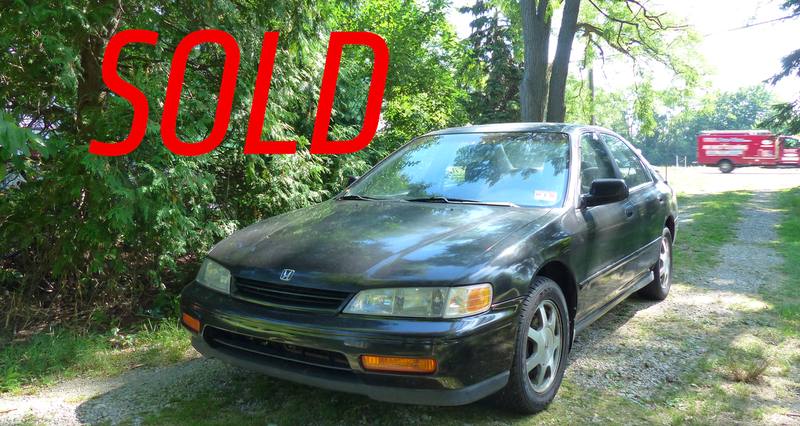 My piece of crap Honda Accord, which has been ruining my life since day one, is finally sold and out of my hair. Okay, actually it’s not, because I’m a genius and sold it to my landlord. Who happens to live 50 feet away. And who can’t drive a stick. Crap, I think I did this wrong. In general, if you want to break up with someone and never hear from them again, you should cut all ties. Maybe delete their number, block them from social media if you have to, and avoid them at all costs. Whatever you do, do not—under under any circumstances—move next door to them. That would be stupid. But that’s essentially what I just did. The Honda sits in my landlord’s driveway. I live in that light blue house in the background. My Honda and I have had a terrible relationship since the beginning, and even writing about it makes me feel ill. I bought the car last year so I could have something to get me to and from the junkyard as I built up my $600 Jeep XJ for the Easter Jeep Safari. But even before I got it home, the car started to fall apart, nearly separating a ball joint on the highway—a failure that could very well have killed me. Luckily, the ball joint held up and I didn’t die, but the following eight months of ownership have been true hell, as I’ve wasted many weekends trying to get The Most Unreliable Honda In The World into “marketable” shape so I could just get it out of my life. Look at all the parts I’ve had to replace over the course of eight measly months. Now that I’ve replaced basically the whole car (see the list above) and it’s back in good nick, you might wonder why I don’t just keep it. Chances are, the crap-can is no longer a crap-can and will last another 100,000 miles with nary a problem. The honest answer is that, even though I know it’s not the machine’s fault for breaking (the car was clearly mistreated in previous relationships), I’ve grown to vehemently detest it, and I just want it to go away so I can move on to cars I actually like. He offered $1,200. I told him $1,450 was a firm price. He hit me with $1,250. I told him $1,350, and BOOM, the Honda was gone. My landlord lives right next to me. Except not really, because only after getting rid of the car did I realize just how much of an imbecile I am for selling a car I never want to see again to my landlord, who lives right next door and who can’t even drive stick. Oh boy. What have I done? Will I have to replace a clutch soon? Gosh, I don’t want to touch that car again. Maybe I should just disappear— pack all my things tonight, string my five Jeeps together like an Australian road train, and fall off the grid. Something tells me my Honda Accord nightmare isn’t over—it has only just begun.